I can safely say that last night was one of my gigs of the year. And that is a huge compliment to the three bands who played last night at The Portland Arms, Cambridge. The night kicked off with the classic indie sound of Cambridge band The Lost Volts. Their slot was filled with great indie tunes, with their energetic frontman at the forefront of their sound. The track Cyclone really stood out, a great set and a band to look out for on the local scene. 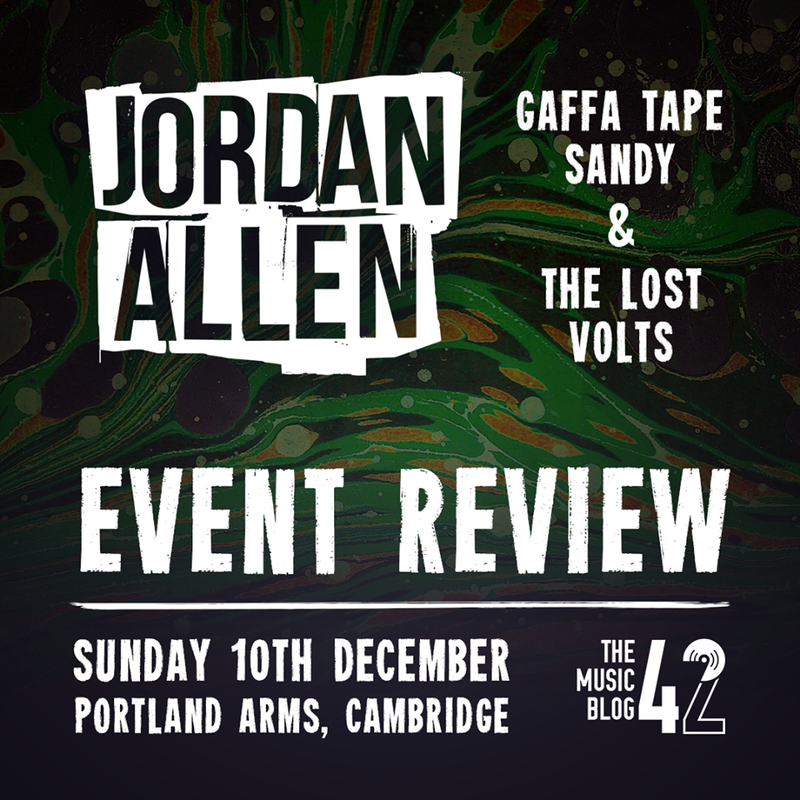 Next up: Gaffa Tape Sandy, the Brighton/Bury St Edmunds-based band who have had a phenomenal year, after playing a set at Glastonbury and being endorsed by BBC Introducing. The list could go on. But anyway, their set was everything I expected of them, energetic, euphoric and just incredible. Their catalogue of songs are just filled with anthemic garage rock tunes with Pink Neck/Train Wreck and Manager being the real highlights of their set, along with fan favourite Beehive and their NEW track Turnstile getting a worthy reception from the crowd. New Gaffa Tape Sandy music is coming. And I for one can’t wait. When Jordan Allen took to the stage to round off the night, you just knew you were going to have a good time. Kicking off their 45-minute headline set with Imperial Leather Dreams, the track set the precedent for the evening with tracks packed with insane riffs and clever lyrics written by the frontman himself. The four-piece indie rockers from Bolton tore through the rest of their setlist, firing out bangers like the track 110 Ways To Make Things Better and absolute belter Too Much Too Soon. Jordan Allen definitely have a hint of The Sherlocks about them, and it’s no surprise they’ve supported the Sheffield band in the past. The group closed with arguably their two most popular tracks: the belting Helter Skelter and new track R.O.S.I.E, two of the best tracks you’ll hear this year. Great indie tracks coupled with their incredible energy and presence on stage proves that they are on to a winner. They are bound to hit the big time. Jordan Allen’s latest single is called R.O.S.I.E! Available on all streaming services and on iTunes to purchase. The band also play TONIGHT at The Waterfront Studio, Norwich! SPRING KILLING, available on all streaming services and to purchase from https://gaffatapesandy.bandcamp.com! They play The Fiver at Cambridge Junction on Friday 12th January, tickets £6!